The proximity of soft, sentient bodies with the solid objects around us, especially in an urban environment, is culturally and psychologically significant. As the ancients were well aware, the frisson between ephemeral flesh and enduring stone has memorial value, and warns us what we too must become. All earthly glories are destined to decay into nothing but whitish bones inhabiting marble tombs or sarcophagi, or surmounted by gravestones. In life, however, this paradox can be a source of joy. It is the interaction of our elastic muscle with rigid skeleton that enables us, as terrestrial vertebrates, to move through the world, biomechanically negotiating its gravity with comparative grace and facility. Fluent bipedal locomotion is one of the hallmarks of our species, and is the ability that skiing is built upon, using (like writing and painting) ancient and fundamentally simple devices that augment the powers of our limbs at their distal ends. The speed of winter sport thrillingly intensifies the flow of sensory information (vision, balance and kinaesthesia) that is normally taken for granted when walking or otherwise moving in more routine fashions. However, we know that should our control and balance fail, we run the risk of colliding with something effectively much harder than ourselves. Somewhere, under the snow, or downhill or beside, are rocks, trees and ice; and the snow itself can of course become a lethal force if travelling in an avalanche. 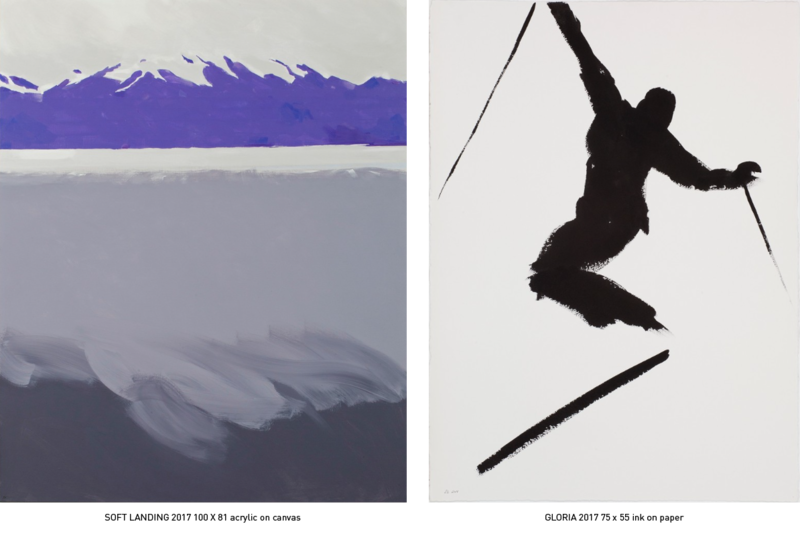 Zoe Kronberger’s masterful painting Soft Landing, the centrepiece of her current exhibition at Wimbledon Fine Art, elegantly gives us a landscape of experience and memory that may at first appear gratifyingly familiar to many skiers, mountain-walkers and aviators. In the far distance, under a film of stratospheric cloud, there are purplish mountains capped with pristine snow, emerging from another layer of white, which is the top of a valley-bound overcast. This is a ‘nebelmeer’, a sea of cloud, also famously pictured by the German Romantic painter Caspar David Friedrich in his Der Wanderer über dem Nebelmeer of 1818 (Kunsthalle, Hamburg). Yet here, unlike in Friedrich’s image of implicit national longing, we are not placed behind some masculine young idealist clad in a black frock-coat, gazing purposefully at the horizon from his summit, in a visual symphony of the deep geological past and a radiant future. Instead, Kronberger, through a deft turbulence of hand and brush that echoes the horizon, draws us into the cloud’s grey interior, and then compels us to look below, onto a mysterious, slatey darkness. It could merely be the shrouded, twilit valley below, or a deeper layer of fog. But, notwithstanding the visual attraction of the snowy peaks in the distance, the destination, like skiing or flying, is downwards. We are unsure whether what meets us will be welcoming or unyielding.